His was just a dream, but it can be a reality for you. Being Irish has its share of myriads of advantages. However, one thing most of us Irish fellows rue about is that the sun barely ever shines brightly over Ireland and we have to make the most of our share of bright golden sunlight whenever we can. That’s the reason why sun rooms are becoming a common sight in most of the houses lately, irrespective of the size of the house. Sun room adds a whole new dimension to your property. A sun room is the ultimate definition of luxurious experience of life, right in your own house. A sun room extension we construct are specifically designed to retain heat in winter while keeping you cool enough in summer. In addition, it will immensely lift your property value on the resale market. We were among the first construction companies in Dublin to realize this very need and have developed a state-of-the art sun room service for our fellow Dubliners. Why choose NÜHAUS for your sun room project? We are not merely a construction company that follows architectural plans. We provide our own design services as well. That means you get design and construction services, all bundled into one. This will save you a lot of precious time and money. What’s more, potential frustration when you realize that the architects and construction company didn’t really share the same ideas will be a thing you will never have to worry about with NÜHAUS. 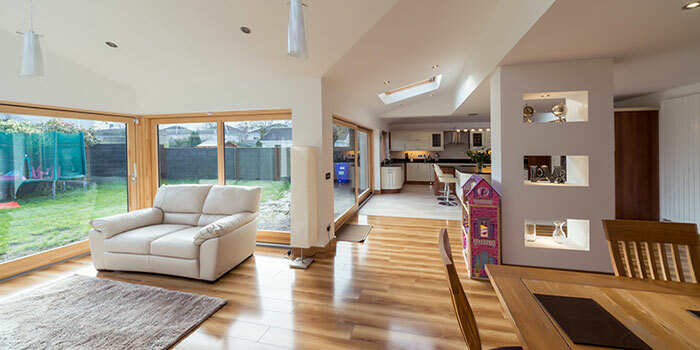 We are among the leading building contractors in Dublin and our large customer base can safely vouch for us. We have established a healthy working relationship with local authorities to ease up the processes of applying for planning permission and grant approval for the projects. We offer a variety of quality material for the construction of sun rooms. With sun rooms designed and build by our teams of experts at NÜHAUS, you can save considerable amount of money on your monthly energy expenses. This means the sun rooms will pay for themselves within a few years.